Posted on June 24, 2016 at 12:00 pm. If you’re struggling to land your dream role – or any role – it might not be because you lack the “X factor”. What makes an actor stand out in an audition isn’t always their talent or looks – it’s their professionalism. Even big names have to audition or do screen tests. If you really want to be an actor, this process isn’t going end any time soon – so start getting it right! It’s unfortunate, but small audition mistakes could cost you the role of a lifetime. Lucky for you, I’ve seen them all. Ok, this one’s for those of you new to auditions. Try some calming techniques beforehand to help you walk in without the jitters. You could meditate, pop to the gym, or play a quick game of Sudoku: whatever sets your mind at ease. If you (like many actor types!) lack an “inner serenity,” you can find comfort and relaxation at the audition itself by socialising with those around you. A friendly face and some small talk can work wonders for an extrovert’s sense of confidence. When you walk into the room, there should be an ‘X’ marked on the floor – this is where you stand. It’s a good starting point for your performance, but don’t be afraid to move around: you should be dynamic with your whole body, not just the upper half! If speaking to someone in a scene, do not address the panel. Look slightly downstage of them. This is because they’re here to watch your performance, not partake in it! Unless, of course, you’re doing a scene with a reader – feel free to look in their direction. Don’t signal the end of your scene with a flourish and a “ta-da!” Just relax, stand still for a moment, and then look to the panel. Perhaps say “thank you”. When interviewing with the directors after performing, don’t stay in character – I know it’s the method way, but the show is over! Ask questions. Show the panel you’re familiar with their work and admire it. You need to demonstrate that you’re a professional, and easy to work with. You can be difficult to work with when you’re famous. Confidence is key everywhere, but especially here. If you show physical signs of nervousness, you might not be the leading actor they’re looking for. The moment you walk into that audition every part of you is being judged, from the way you move your feet when you walk to the first words you say when you open your mouth. It sounds scary, but is nothing a little practice won’t help you solve. In your day-to-day life try to stay aware of how you walk and talk, and it won’t just help your auditions – it could very well improve your social life, too. When you interview you should let your personality come through. Don’t just answer the panel’s questions – have a conversation! You should let them know who they’re getting the chance to work with. On that note: while confidence is fantastic, arrogance is not. Your conversation should be friendly but above all, respectful. As in an interview for any other position, you should have questions prepared. What does the character say about themselves? What do other characters say about them? What have previous writers and directors of the characters said? If your scene doesn’t let you explore more than one or two motivations/emotions, ask questions about the character. This will tell the casting director that you are prepared to fully live it. Alternatively, you could go full method and walk into the audition performing and interviewing as the character. However, few people can pull this off in a way that doesn’t seem arrogant. Showcase a few techniques if you have enough context. It’s worth reading up on the director and what kind of acting they like, or even past iterations of your character. Is your Peter Parker written in the 1960s by Stan Lee, or directed by Julie Taymor on Broadway? You should take a fresh approach to everything, but it can’t hurt to incorporate techniques you know work. Acting is to do, not to read. Stay dynamic in your scene, and try to communicate the character through its physical behaviour as well as through your voice. Stay vulnerable and open to emotional change; this is easiest done if you are a method performer, truly feeling what your character is. Is there a preferred number of pieces? What type of material am I allowed? Is this a monologue or a scene? These are very basic – but a basic mistake is the most likely to cost you the job! Now that you know what you can work with, it’s time to choose material that best showcases your abilities. If performing multiple scenes, try to portray contrasting emotions – but don’t make an entirely new character each time. Directors want range, but in an audition they also need to see consistency. It should go without saying, but: learn your lines. Don’t just memorise a speech or scene, but actually know the lines inside out. There is a good chance you will be asked to deliver a line in a way you haven’t practiced: if you memorised a speech instead of a paragraph, your muscle memory might make this hard to do. The best way to know your lines whilst maintaining flexibility is to practice them in a few different styles, so cadence and rhythm don’t play into your memory. The great method actors sometimes go further: they will physically and emotionally embody the character for some time, and only learn the lines a short time before performance. This lends an authenticity to the words as they’re spoken. Practice is important not just before an audition, but also in between them: your art, like your muscles, must be exercised to stay in top form. You can take an extra acting class or join a community group – whatever helps you stay in shape. When practicing for a specific audition, it’s often helpful to record your performance. By doing this you can time the length of your speech, check your technique, or even get someone else to watch it and help you build a better performance. Whether you’re starting off in the industry or you’ve been on the scene for a while, we have a course to help: we have one-off classes, a three-day boot camp, or the much longer Ultimate Acting Programme, which runs from October this year. 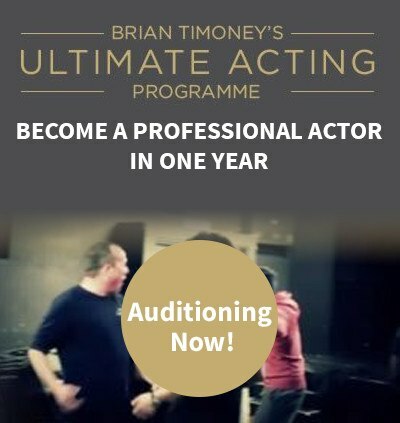 All of our courses will expose you to industry professionals and help get your foot in the door: the Ultimate Acting Programme even includes meeting a Hollywood casting director. If you want to learn which of our numerous courses is perfect for your career, don’t hesitate to get in touch.